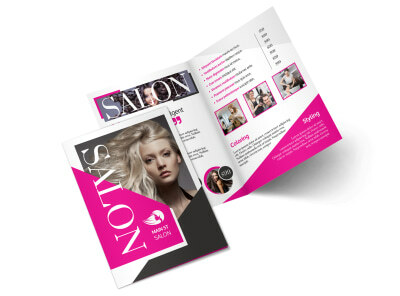 Clip away at your competition by distributing brochures to promote your salon or spa. 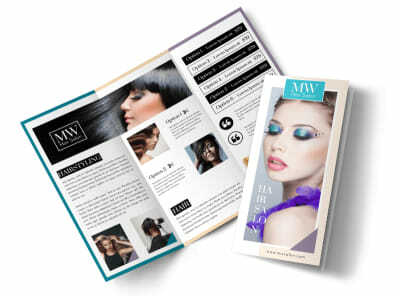 Our online editor and beauty brochure templates make customizing a brochure to detail your services and products easy and hassle-free. 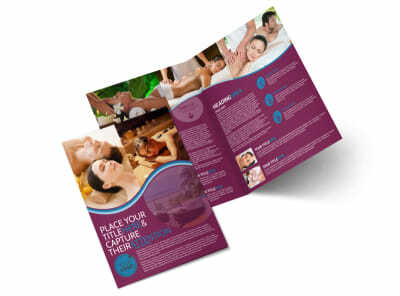 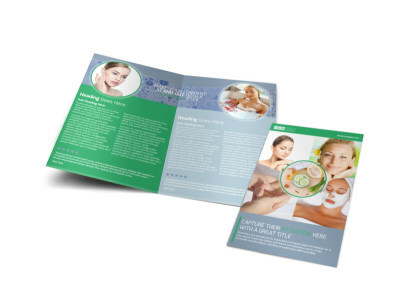 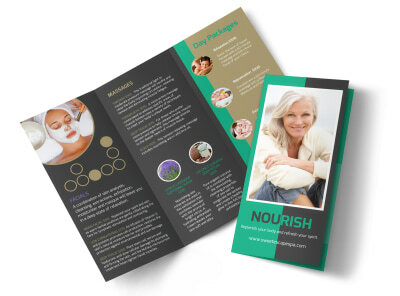 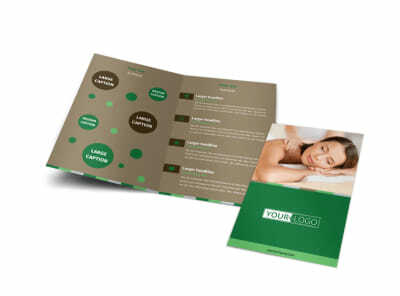 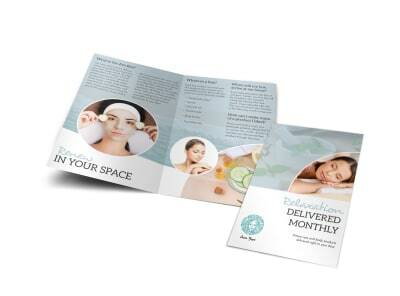 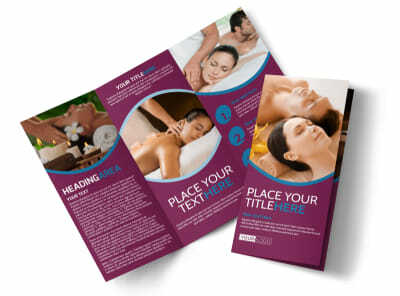 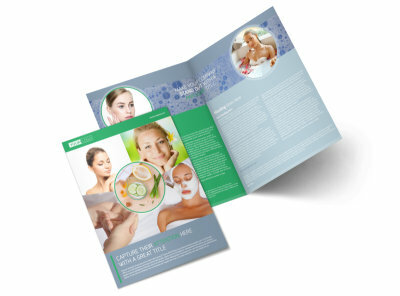 We offer a wide variety of templates including beautiful spa brochures. 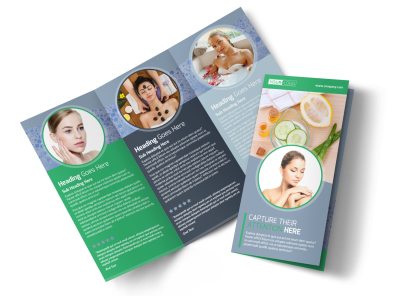 Our intuitive software lets you upload your logo, images from your facility, or even before-and-after shots of willing clients – all of which can help potential and existing customers get a true feel for what you can do for them. 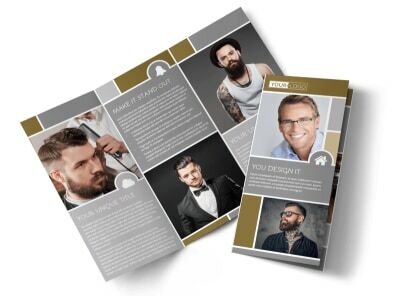 Choose from a range of size and fold options, and then go for our high-quality printing to achieve professional results that set your salon apart as a cut above. 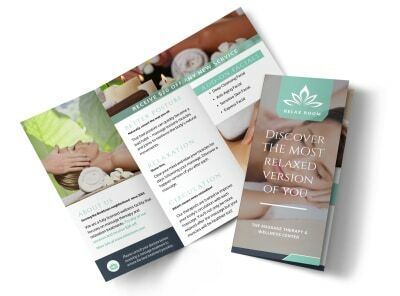 Don’t be afraid to toot your own horn when sharing your massage skills and services with potential clients. 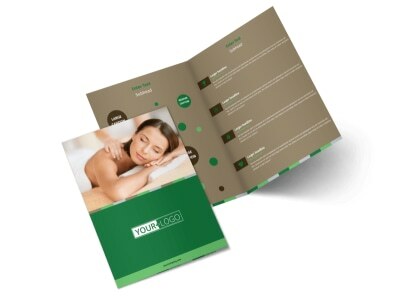 After all, you’re a pro, and your marketing materials should have an equally professional look to match. 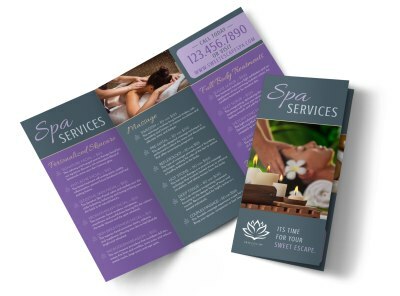 Take advantage of our team of professional designers by choosing one of their specially-made massage brochures to customize. 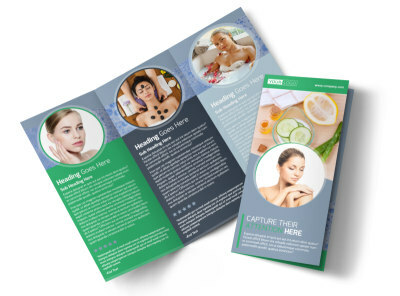 Using our online editor, you’ll be able to generate a variety of brochures – give clients a birds-eye view of the scope of your services or go in-depth on a specific offering, such as chair or hot stone massages. 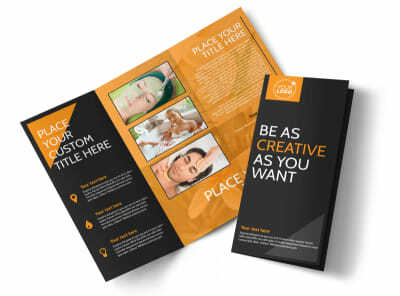 The choice is always yours – you know your business better than anyone. 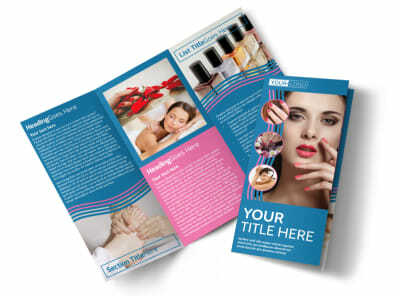 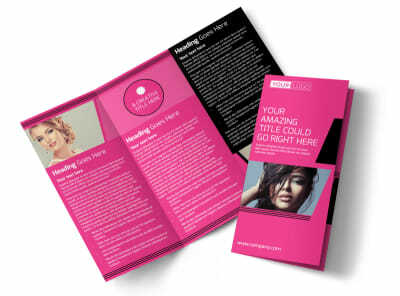 Print the brochures yourself or allow us to deliver a premium print job right to your front door – you won’t regret it! 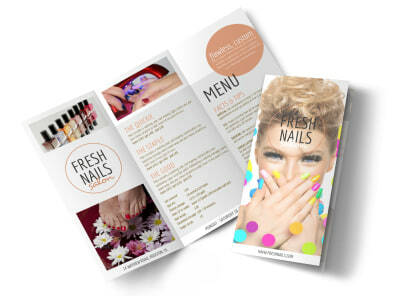 Show off what sets your nail salon apart from all the rest. 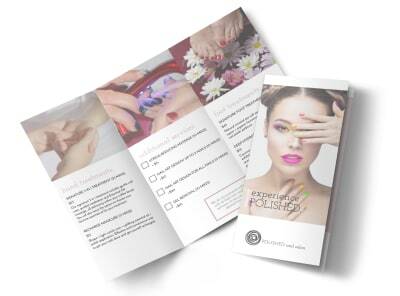 As the world’s greatest [fictitious] hand model, J.P. Prewitt (aka David Duchovny), said in Zoolander, “We think differently than the face and body boys… we’re a different breed.” Customize a nail salon brochure that highlights the unique skills and offerings of you and your talented group of fellow nail techs. 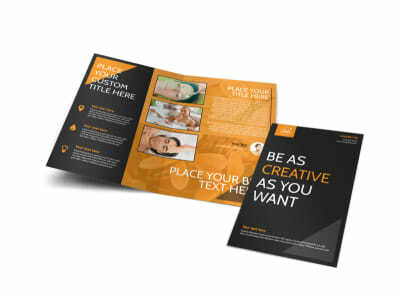 Upload photos of your staff in action or select from our wide variety of available stock images. 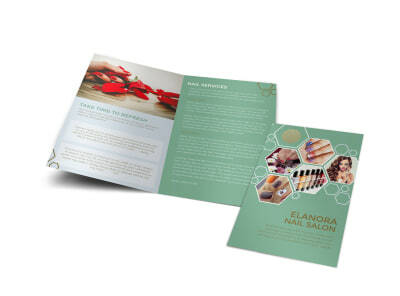 With our online editor and array of professionally-designed templates, your brochure will be designed and ready to print quickly – you’ll be back to prepping hands and feet worthy of hyperbaric chamber preservation before the polish can dry! 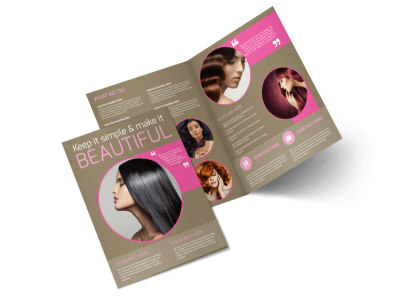 Your salon is a whole lot more than just hair. 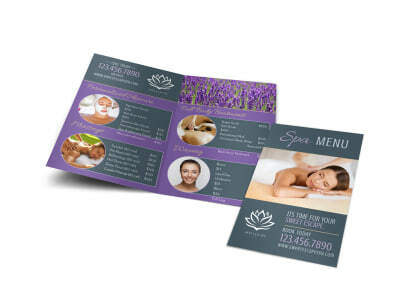 Let your clients (and your community!) 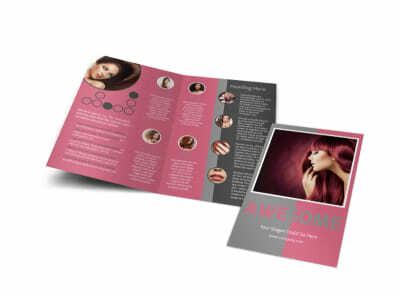 know what you have to offer by customizing an informative and attractive beauty salon brochure that lays out your skills and services from expertly coiffed head to perfectly painted toe! 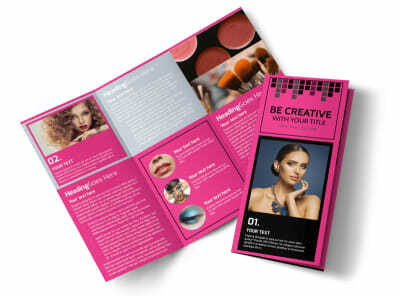 We have an array of fabulously (and professionally!) 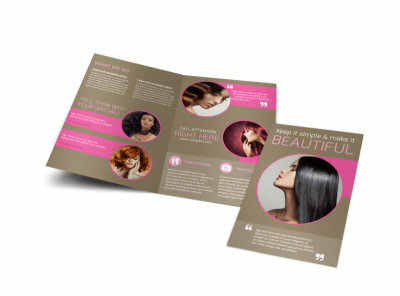 designed beauty salon brochure templates for you to select from. 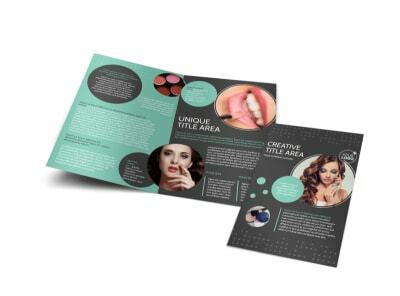 Our online editor makes customization a snap – you can upload your logo and photos, implement the perfect color scheme, and change up the layout until it fits the final product you’ve envisioned. 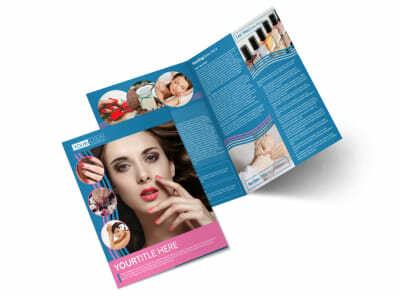 Get started now so that you can have an amazing stack of brochures in hand as soon as possible! 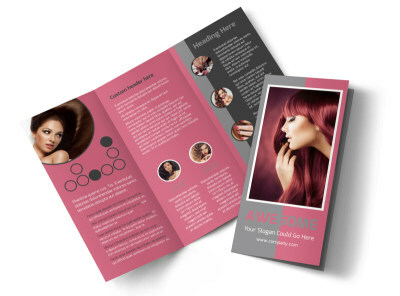 Whether you’ve already worked hard to establish your hair salon and build your client list or are just getting started, communicating with your new and existing clients is essential. 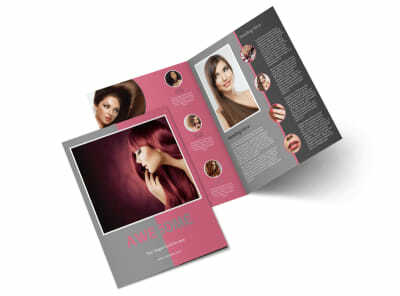 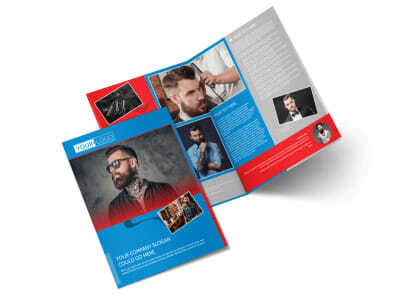 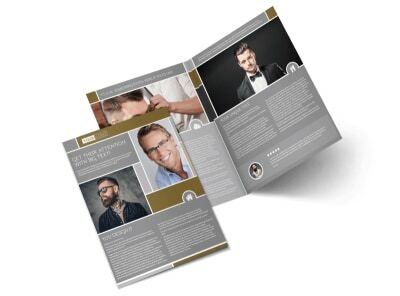 Personalize a professionally-designed hair salon brochure that speaks for you. 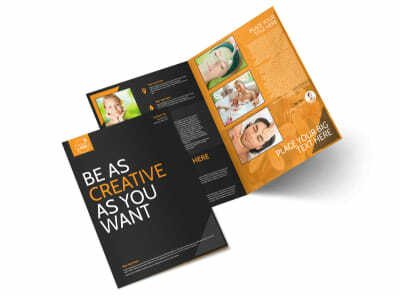 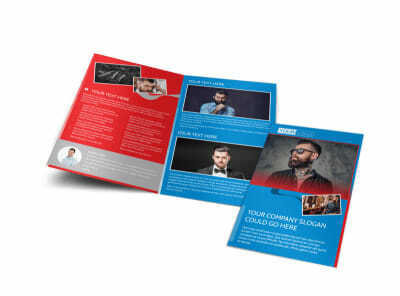 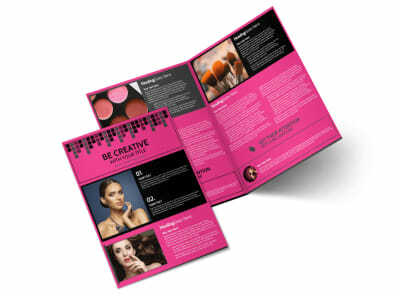 MyCreativeShop has an abundant array of customizable brochure templates designed to fit your needs. 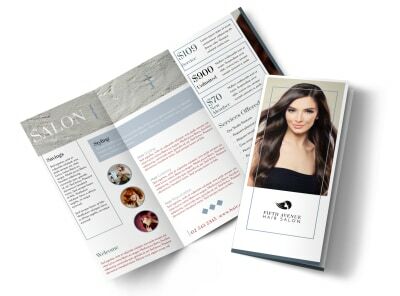 Using our online editor, you can create everything from a detailed menu of your salon’s services, a comprehensive pricing list, and even a brochure filled with your expert hair care tips (caring for your perm, maintaining your color, recommended products by hair type). 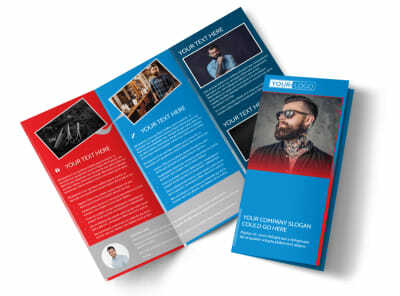 An informed and satisfied clientele is your best group of grassroots marketers, so pick your fave template and get started! 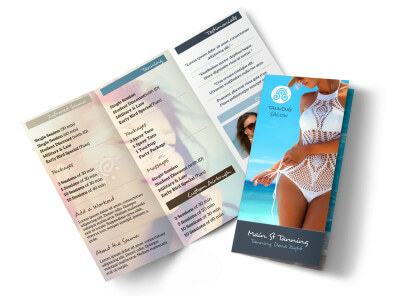 Your tanning salon is more than just 4 (or more) walls and a few tanning beds. 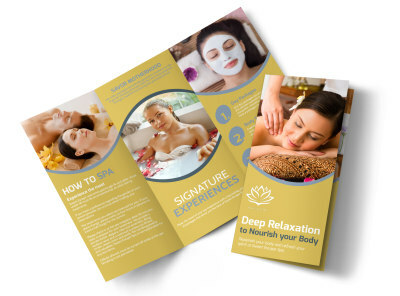 Tell your story in a completely customized, beautifully-designed brochure that shines like the sun (or glows like a tanning lamp)! 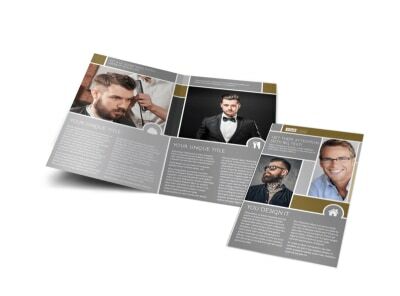 MyCreativeShop’s easy-to-use online editor makes it a snap to do it all yourself – upload professional photos of your salon (inside and out) along with a compelling listing of your unique features and services. 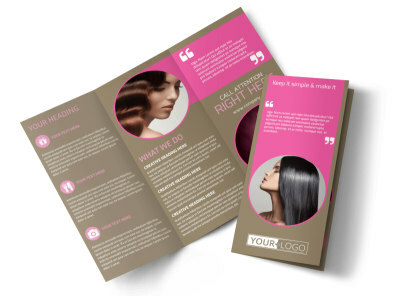 Use all three folds of the brochure to set your salon apart from the rest – sunlight should radiate from every turn of the page. 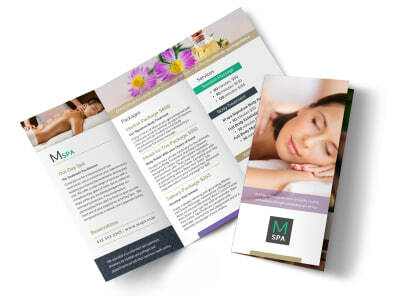 Draw new clients in from the cold by designing and printing your brochure before the sun goes down!